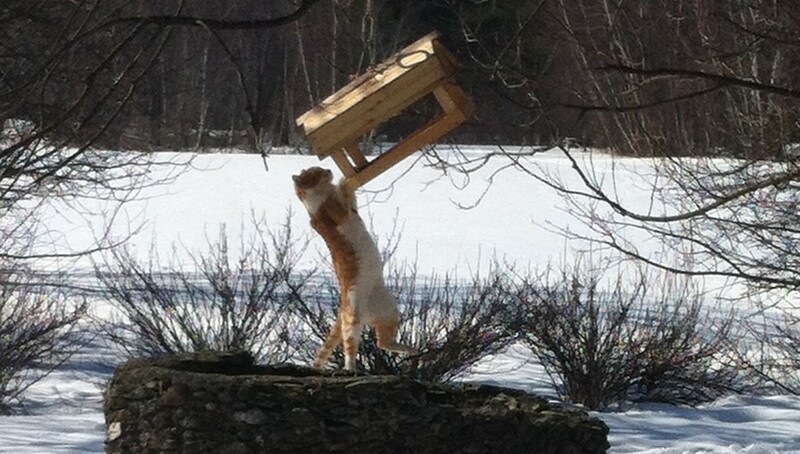 We are missing our little orange barn cat, Pierre. We’ve asked the neighbors, looked for him everywhere in the barn and shed, and called for him in the woods, but his food bowl on top of the haystack remains full. We haven’t seen him in almost two weeks, and have accepted the fact that he won’t be coming back. Pierre came here just about a year ago. Tom Stearns brought him into the office at High Mowing and announced that the cat would be going to the shelter if no one wanted him. Jacob took one look and immediately thought, “My brother!” The resemblance was striking. He couldn’t turn the offer down. Pierre was French. He preferred rustic baguettes and soft cheeses. He also went by Peter, when he was in trouble, Pedro when sporting his sombrero, or Pete when he and Jacob were out with the boys. The two of them were working on an impressive repertoire of tricks. Pierre was also a fierce cuddler; when either of us were around, especially Jacob, Pierre went after our love like he was starving for it. He would melt in our arms, purring, kneading his paws against the canvas of our barn coats, drool bubbling in the corners of his mouth. He seemed unalarmed by the chickens, cows, pigs and dog. All summer long, he nestled into the hog pile to sleep, and no one complained. Each morning he would race into the chicken coop behind me, and sit around in a circle with the hens, lapping water as they pecked at it. They lined up that way, like siblings on school days gathering at the table to eat their breakfast cereal. Pierre was a good part of the family. We miss him, but I’ll bet he’s off on a good adventure, wherever he is.